Why PARENTS are the greatest school readiness superheroes of all! We’ve spent the last few weeks talking about the team of people in our own communities who get young children ready for school. This week we’re shining a spotlight on the greatest superheroes of all: PARENTS. Despite the vital role that early intervention, education, libraries, faith communities, and all our community superheroes play in getting kids ready for school, research consistently shows that the greatest superheroes of all are parents. With back-to-school events happening as we speak, it’s officially time to start getting ready for the fall schedule. But what is true school readiness? That’s what we’ve been talking about the last couple of weeks on the blog. It takes a team to get each child ready for school. And YOU — as parents, coaches, librarians, health care providers, early childhood teachers — are a critical part of that team. 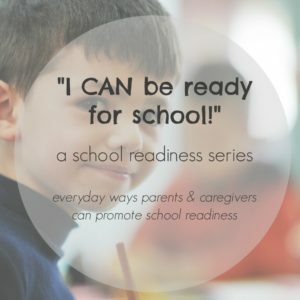 Is Your Child Ready for School? Get your FREE Readiness Tool! At Pickens County First Steps, we are all about school readiness. Readiness doesn’t have to be complicated.